Summer where have you gone?!? The weather in the UK has been terrible this summer, thank god I had two weeks in sunny Malta to see me through. It really feels like a lifetime ago I got back from my trip but only a month has passed! Here is another look from my travels to cheer you up on this miserable evening. I wore these super bright red trousers for an evening of sightseeing in Valletta, Maltas capital city. I wanted to be comfy but of course still bring the fashion, these trousers from H&M ticked all the boxes. I don't believe they are in stock anymore but they do have a newer version without the tie waist. Malta really is the island of beautiful doorways, I mean check out this beauty! If your into the hashtag #ihavethisthingwithdoors then Malta is a must visit. Valletta is also a must visit, the city is recognised as a UNESCO world heritage site and has also been selected as the European capital of culture 2018. 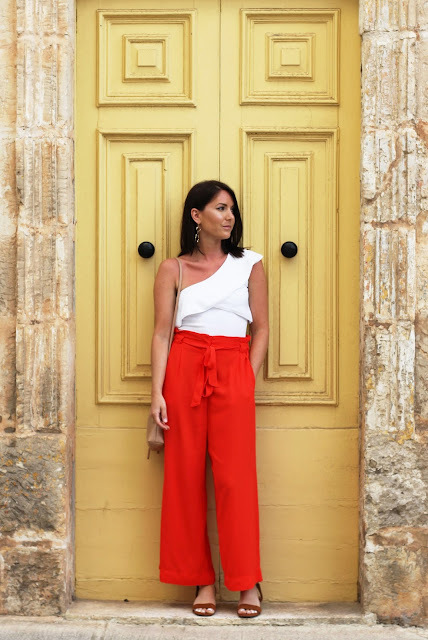 I will post more looks from Malta over the coming weeks but for now i'm off to have a cup of tea and snuggle on the sofa like its mid October. 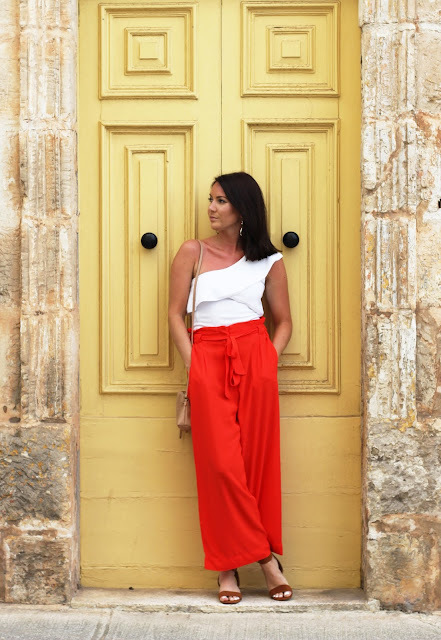 Here is the first outfit post from my recent trip to Malta. My best friend got married over there and it was absolutely amazing. We stayed in Mellieha which is at the very top of the country, a quiet and chilled place with a lovely beach. Malta doesn't have many beaches so this was the main reason we decided on Mellieha. It isn't a very big island at around 20 miles long so if you go you can really stay anywhere and just get buses or taxis everywhere. We stayed at the Maritim Antonine Hotel & Spa, a gorgeous hotel with the most amazing views of Mellieha bay from its rooftop pool. If your visiting Mellieha I would definitely recommend the Maritim Hotel for a chilled out stay with a great breakfast selection, a choice of 3 pools including an indoor pool, a large gym and a beautiful spa. It is abit of a walk down to the beach but you are right beside the restaurants, bars and shops and buses stop right outside the hotel which all stop at the beach. I wore this outfit the evening before the wedding for a meet and greet at The Royal Malta Yacht Club. I decided on this swiimsuit from H&M with a slight nod to the nautical venue and dressed it up with these gorgeous green silk trousers also from H&M. I will post further looks from my trip over the next few weeks, including some pics of Mellieha as it really is a beautiful little place. Finally got around to posting on here, it was on my none negotiable list for this weekend. I've been having major problems with my memory card that has photos from NYC on it so the postcards from New York blog post will have to wait. For the meantime here is one of my looks from my recent weekend in Milan. I'm wearing a floral print wrap dress which I left open so it looked more like a kimono. This was a perfect day to night option, after a full day sightseeing i was able to tie it like a dress and completely change my look. Milan was perfect as Italy always is. We drank lots of coffee ate amazing pizza and spent time with family and friends. This weekend is a busy one I'm working as a wedding photographer, going to a 2nd birthday party and I'm also off to Edinburgh for a shopping trip with my mum.